With Florida’s 2012 Regular Legislative Session set to begin on January 10, Colodny Fass lobbyist Katie Webb authored an article entitled, “A Revamped Citizens and Cat Fund in 2012? 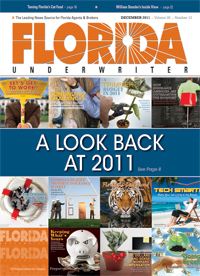 Preview of Property Insurance Issues for the January Legislative Session” for Florida Underwriter magazine’s December 2011 edition. The article, which is reprinted below, can also be viewed by clicking here. A Revamped Citizens and Cat Fund in 2012? Given the comprehensive nature of residential property insurance reform in SB 408, which passed during the 2011 legislative session, expect Florida’s 2012 session to be a much quieter year in terms of property insurance. Both the House and Senate seem inclined to give the reforms passed in 2011 a chance to work. The exceptions to this approach could be legislation relating to Citizens Property Insurance Corp. and possible changes to the Florida Hurricane Catastrophe Fund (Cat Fund). Further, legislation allowing surplus lines insurers to take out Citizens’ policies has been filed. Citizens, created in 2002, was originally intended to be the insurer of last resort for property risks in Florida. However, it is now the largest property insurer in the state. As of Sept. 30, 2011, Citizens has 1,460,672 policies in force with $508.5 billion in exposure. In the summer of 2011, Citizens gained five new board members, many with unique insurance experience. Carlos Lacasa, a former member of the Florida Legislature from Miami; Carol Everhart, an insurance agent from St. Petersburg; and Tom Lynch, an insurance agent from Delray Beach, remain on the Board. CFO Jeff Atwater appointed Nancy Baily, a former insurance company CEO; and Robert Wallace, a former member of the Florida Legislature and Tampa resident. Gov. Rick Scott appointed John Rollins, an independent actuary and former Citizens employee; and John Wortman, who had previously served as the CEO of Louisiana Citizens Property Insurance Corp. CFO Atwater appointed Lacasa as chair. In a recent presentation to the Florida Cabinet, Scott Wallace, Citizens’ president and executive director, projected that by year-end 2011 Citizens will have 1,490,865 policies in force. Wallace noted that Citizens would need $13.043 billion to pay claims as a result of a 1-in-100-year event. However, Citizens has $5.742 billion in accumulated surplus; $6.726 billion in reimbursements from the Cat Fund; and $575 million in reinsurance. This would leave a shortfall in all three accounts (the Personal Lines Account, Coastal Account, and Commercial Lines Account) of approximately $10.206 billion. This shortfall would have to be funded by Citizens’ policyholder surcharges ($1.172 billion); regular assessments ($3.606 billion); and emergency assessments ($5.428 billion). Wallace estimated that the total potential assessment in this scenario could be $1,100 for every Citizens’ policyholder and $433 for every private market policyholder. Efforts to depopulate Citizens have slowed considerably. During calendar year 2011 through early September, a mere 28,179 policies were taken out of Citizens. Wallace says that current Florida law encourages growth in Citizens. These provisions include the 10 percent cap on Citizens’ rate increases, the $100 limit on takeout bonuses, the prohibition against surplus lines carriers participating in take outs, and allowing the consumer and the agent to opt out of take outs. Some of the changes discussed by the board that could reduce growth include eliminating liability coverage, raising deductibles, and eliminating certain coverages. Recently, Citizens announced that it will no longer be offering coverage for screened pool enclosures and awnings beginning in 2012. Gov. Scott has been extremely critical of Citizens’ current model. Recognizing its vulnerability, the governor is demanding that the board find creative solutions that will shrink Citizens’ policies and exposure. He wants the board to make recommendations at the Dec. 6 Cabinet meeting. Board Chair Lacasa has urged new member Wortman, who has considerable experience in successfully leading the Louisiana Citizens Property Insurance Corp., to assist in devising a plan to shrink Citizens. Lacasa has suggested mitigating risk through a number of mechanisms and examining the coverages offered by Citizens, while paying attention to the mortgage requirements of Freddie Mac and Fannie Mae. While the board explores ways to reduce Citizens’ exposure, legislation has been filed in the House and Senate for the 2012 session that would allow surplus lines insurers to participate in depopulation programs. HB 245 was filed by Rep. Jim Boyd, R-Bradenton. The Senate companion, SB 578, was filed by Sen. Garrett Richter, R-Naples, who is the chair of the Senate Banking and Insurance Committee. Both bills allow certain approved surplus lines insurers that maintain $50 million in surplus, an A.M. Best rating of at least A-, reserves, surplus, and reinsurance to cover a 100-year probable maximum loss two times in one hurricane season to participate in take outs from Citizens. The bills also would require notice to the policyholder that there is no coverage from the Florida Insurance Guaranty Association. These surplus lines companies would be required to post a deposit equal to the unearned premium, net of unearned commissions, on the assumed policies. The deposit would be held for the benefit of policyholders in the event of an insolvency. The bills allow additional types of insurers and insurance-related entities considering depopulating Citizens to receive Citizens’ underwriting and confidential claims files. Under the bills, reinsurance intermediaries, eligible surplus lines insurers, and entities created to seek authority to write property insurance are allowed to receive Citizens’ files. HB 245 was heard on Nov. 2 by the House Insurance & Banking Subcommittee. The bill passed the subcommittee by a vote of 13-1. SB 578 has not yet been heard. There have been other discussions during legislative committee meetings of a desire to file legislation that would limit Citizens coverages and exposure. At the time of this writing, no legislation has been filed. While Citizens has received significant political attention lately, the Cat Fund also has drawn some scrutiny for reform. This tax-exempt state-managed trust fund has liabilities of $18.4 billion for the 2011-2012 contract year and projects its year-end cash on hand to be $8.4 billion. Although in October 2011 the bonding capacity for the 2011-2012 contract year was estimated to be $8 billion, COO Jack Nicholson testified at the Nov. 15 Cabinet meeting that the fund probably could sell no more that $7 billion in bonds. This would leave a shortfall of approximately $3 billion. Reduce the limits of the fund’s mandatory coverage layer from the current $17 billion to $12 billion over a 3-year period, with a provision for increased limits after the fund can fully fund its single-season capacity and its second-season capacity. Increase the participating insurer co-pay by reducing the maximum available coverage percentage from the current 90 percent to 75 percent over a 3-year period. The lower coverage options of 45 percent and 75 percent would remain available. Increase the aggregate insurer retention to $8 billion for the 2013-2014 contract year, and retain current provisions that automatically adjust the industry retention each year based on the fund’s exposure growth. Increase the cash build-up factor by 5 percent a year until the 2018 contract year, when the factor would reach 50 percent. Beginning in 2015, reduce the maximum emergency assessment for a single year’s losses to 5 percent and for all losses from all years to 8 percent. Terminate the fund’s Temporary Increase Coverage Layer after the 2012 contract year. Change the name of the Florida Hurricane Catastrophe Fund Finance Corp. to the State Board of Administration Finance Corp.
A recent analysis of this draft proposal by Florida TaxWatch noted that while the proposal may limit the potential for assessments, it would likely lead to an increase in Cat Fund premiums to insurers and ultimately the consumer. As of today, no legislation to restructure the fund or to implement Nicholson’s draft proposal has been filed. With larger issues such as reapportionment and the state budget facing lawmakers, the consensus at this point seems to be to give the reforms in last year’s omnibus property insurance bill a chance to work. While there may be legislation filed to address smaller housekeeping issues, there does not appear to be a strong movement for comprehensive legislation in 2012 addressing property insurance as a whole.